Use this page if you want to make somebody know this website. A presentation will be sent to them. Anti-spam question : how much are 4 plus 12 (write the answer with numbers) ? 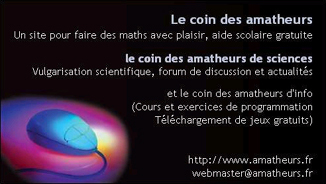 If you want to distribute it, here is the visiting card of the coin des amatheurs de sciences. If you want some hard-bound copies, please contact me.